I've been on a deck-building kick recently, so sticking with that genre, it is time to review Thunderstone . 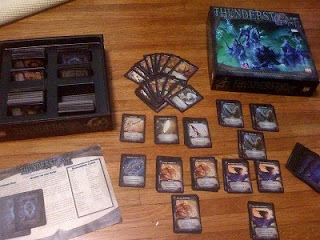 As far as I know, Thunderstone was the second widely produced game in the deck-building genre (after Dominion, but before Ascension Chronicle of the Godslayer, Heroes of Graxia, The Resident Evil Deck Building Game, and Arcana). In Thunderstone, each player must decide on their turn if they will go to the village, where they can level up their heroes and buy new cards for their deck, go to the dungeon, where they will attempt to defeat monsters to gain victory and experience points, or finally if they "rest" - thus being able to trash a single card from their hand, draw a new hand, and end their turn. If they go to the village, they are able to first level up any heroes that are in their hand assuming that 1) they have enough XP (generally earned from defeating monsters) and 2) the next level of that hero is still available in the common card piles (there are 3 levels for each hero, and the number available at each level gets lower). After leveling up heroes, they are able to use the remaining cards in hand to purchase new heroes, equipment, spells, etc. - collectively known as "village cards". If they choose to go to the dungeon, then the player reveals all of their cards, totals their attack and magic attack totals along with their "light" total, and then chooses which monster to attack and determines if they are successful. Thunderstone, as the second deck building game, added a lot of new concepts to the genre. First, it added the RPG element of heroes and monsters. Instead of buying cards just to help in buying victory points, you are now buying cards in order to be able to defeat monsters (Resident Evil borrows heavily from this). Even within the standard RPG elements, however, they did this well. One element that shows the game is well thought out is that the XP goes to a different pile instead of in your deck. If it were to go in your deck, then you would wind up with issues related to having to draw the XP and the heroes in the same turn, and it would really cause leveling up to become a non-factor in the game. I appreciate how the XP is treated. Also, they added to the standard "dungeon crawling" RPG element the concept of light. The further into a dungeon you go, the harder it is to see the monsters unless you have brought light with you. Whereas this sounds like a no-brainer, this is the first game where I have seen this actually play out, and it plays out simply but effectively - for each light you are missing, you must add 2 more points of attack, and some monsters can't be killed unless you have enough light. With all that said, Thunderstone struggles in a few places. For one, killing monsters isn't often intermixed throughout the game. What winds up happening is that people spend the first half of the game building their deck, and the second half of their game killing monsters, while only visiting the village when they have a bad draw. Some of the village cards make this effect even more dramatic (specifically one called the "Trainer" which allows you to get rid of your basic cards to gain XP without killing monsters). Another more trivial issue is the packaging. Whereas Dominion's box is setup to keep all of the cards separated so that you can easily pick out which cards you are using in any given game, Thunderstone is not. Thunderstone has a few packaging features that are supposed to help this - some larger cards for separating different piles and some raised parts in the plastic holders, overall it does not work very well and you spend a lot more time looking for cards than is needed. Overall, I give Thunderstone an 8.0/10. I appreciated that it was not a simple derivative form of Dominion, but that it truly added some new innovations to the genre, but overall it is not as engaging of a game as Dominion. If you are a fan of the genre, however, and are looking for something new to try, Thunderstone is a good option. You can also check out my reviews of Thunderstone Advance: Towers of Ruin, Thunderstone: Dragonspire, and Thunderstone: Wrath of the Elements.